The adventure started off with a frigid 6:30 a.m. meeting in a gas station parking lot in Draper, Utah where we had arranged to meet. 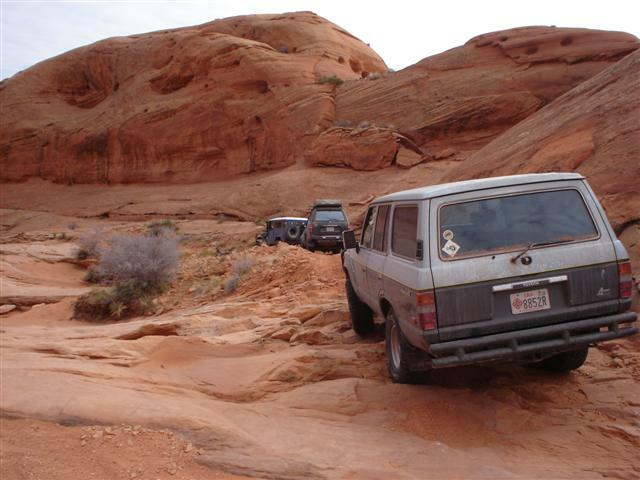 Our venturous group consisted of my wife Candace and myself in my 40 Series Land Cruiser, Richard in his 60 Series, and my seventeen year old brother in-law Thomas in his 80 Series, representing 3 generations of Land Cruisers and several generations of participants to boot. We were all extremely tired, but our excitement kept us moving in despite the dark cold morning. 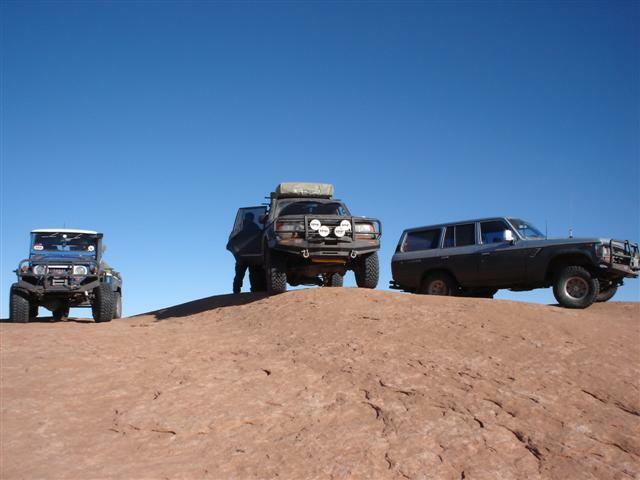 With the gas tanks topped off and tires double checked we set out on our trip. Snow had been furiously coming down all morning and the previous night, and we hadn’t driven 10 miles before seeing a car off the side of the road, I hoped they wouldn’t close the canyon ahead and delay plans. Our 4WD trip started a few hours earlier than anticipated. We ended up locking the hubs at our starting point, cruising up Spanish Fork Canyon in the unplowed snow all the way to Price via Highway 6. From Price to Interstate 70 things were remarkably dry and the temperature started to finally warm up, hopefully a good indicator of the weather we could expect for the weekend. 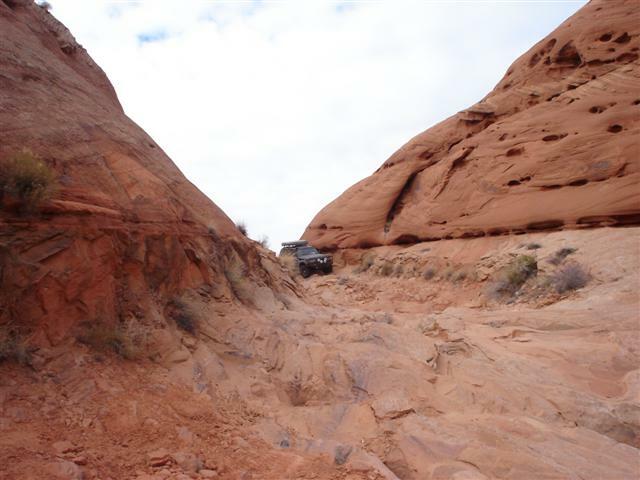 One can really get a grasp of Utah’s varying topography just by driving the 180 miles from Price to Hanksville, traveling through just about every type of terrain in the state. 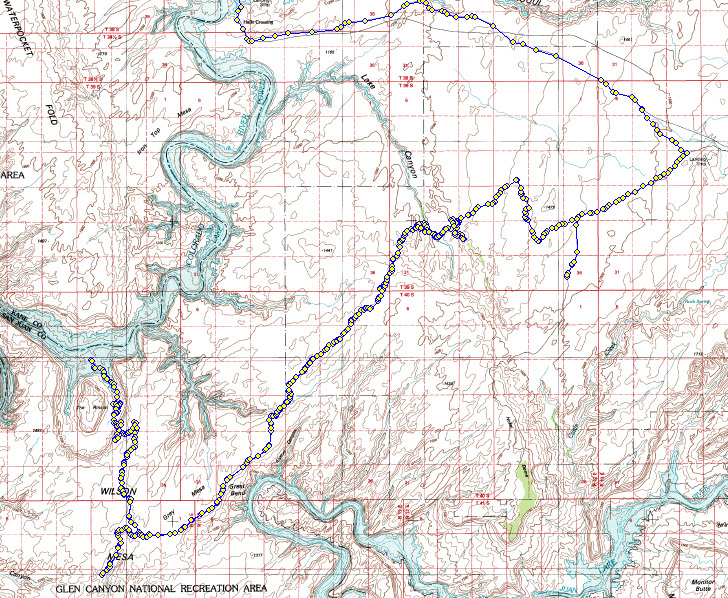 It was hard to pass so many potential wheeling trips, en route to our planned excursion. Alas we had a destination in mind, so we kept moving. We rolled into Hanksville just before noon, giving us a few minutes to kill as we were ahead of our pre-determined schedule. 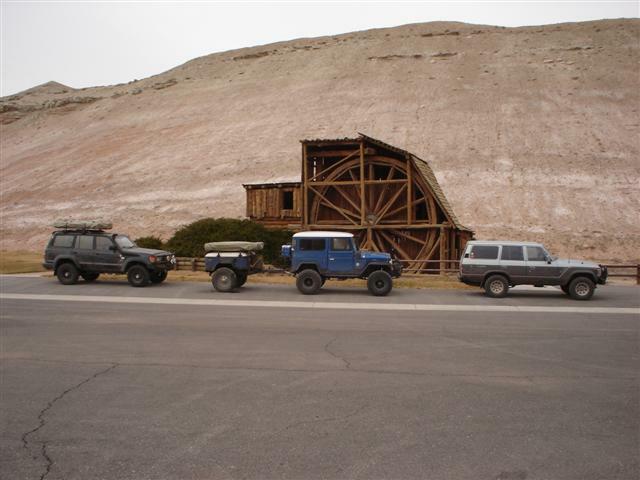 We gassed up the rigs and took off in search of an old turn of the century wood mill that Richard had noticed on a BLM map. 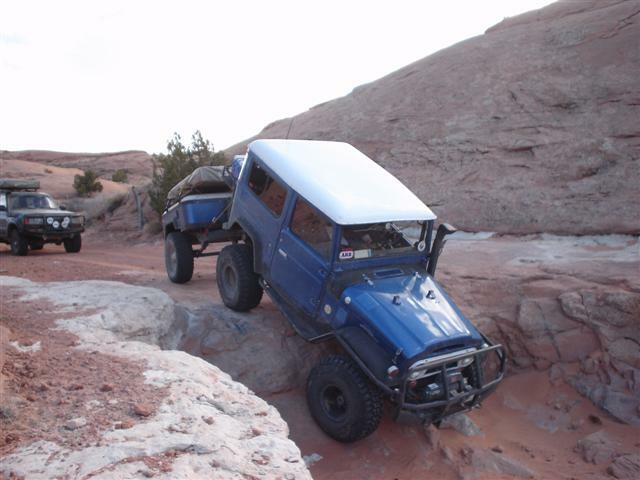 The operational water driven mill was moved piece by piece from a mine in the nearby Henry Mountains to the BLM offices in Hanksville where a small park offers a nice chance to stretch the legs. After a quick look around the mill site, we were back on the highway, heading south towards our next stop, Bullfrog. We arrived at the Bullfrog Marina once again a bit ahead of schedule as the ferry wouldn’t leave for another hour. We topped off the gas tanks at the gas station, browsed for a minute in the gift shop and still had time to kill. Under the recommendation of the cashier at the service station, we went to check out another convenience store on the nearby pier. As we browsed for anything we may have forgotten, the time quickly passed and before long we were in a rush to get back to the ferry loading dock. There was only one other vehicle waiting for the ferry, a mail courier bringing the daily mail delivery to Blanding, Utah. We lined up our Cruisers behind the solo car and waited for the ferry to wave us on the deck. After a couple minutes the ferry’s deckhand waved us up the ramp and to our position on the deck. A few minutes slipped by and before long the ferry was motoring across the lake, and we were wandering about the deck enjoying the warm air and spring like temperatures. The trip across the lake is approximately 30 minutes, giving us just the right amount of time to stretch our legs and take in the scenery. 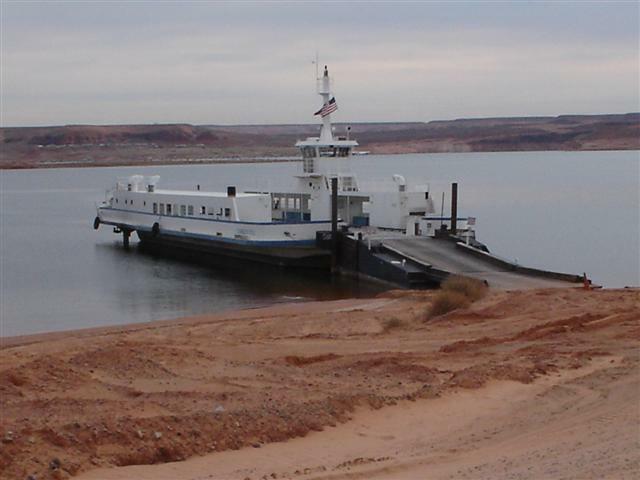 The Charles Hall Ferry, built in 2001 by the State of Utah, has a twin, the John Atlantic Burr which is used in the summertime to accommodate the increased traffic. The 150 foot long ferries have a capacity of over 20 vehicles, and carry the school buses from one side of the lake to the other on a daily basis. During the winter months, the ferry only makes its trip across the lake twice daily, thus planning becomes important. 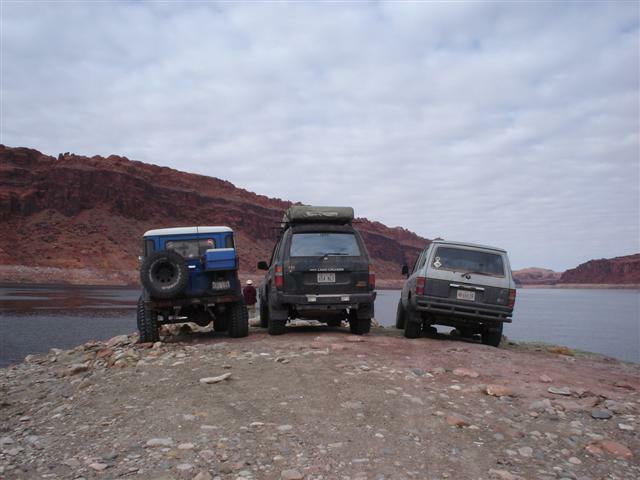 They wasted little time getting us off the boat on the other side of Lake Powell. We were now in Halls Crossing, a rather vacant town during the winter months. We proceeded south on the highway towards the Calvin Black Memorial Airport. The route we had planned would start just south of the airport, and before we knew it that first GPS mark was indicating we were at the trailhead. Our stop at the trailhead was quick, just long enough to drop the air pressure in the tires and grab a drink out of the cooler. We were all rather excited to get some trail behind us, and more importantly to find a place to settle before the sun hid behind the mountains. As we rounded a corner we couldn’t help but notice an old abandoned World War II halftrack, sitting as it likely has for 20-30 years. 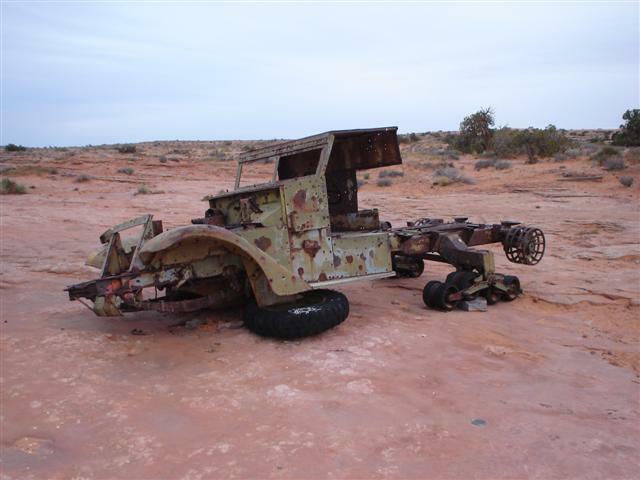 As best we can tell it was likely abandoned due to a broken frame, salvaged for any valuable parts and left to spend the rest of its life in the desert. Within a couple miles we had found another abandoned rig, an old Dodge pickup presumably a remnant of the mining boom that struck the area in the 1950’s in search of uranium. 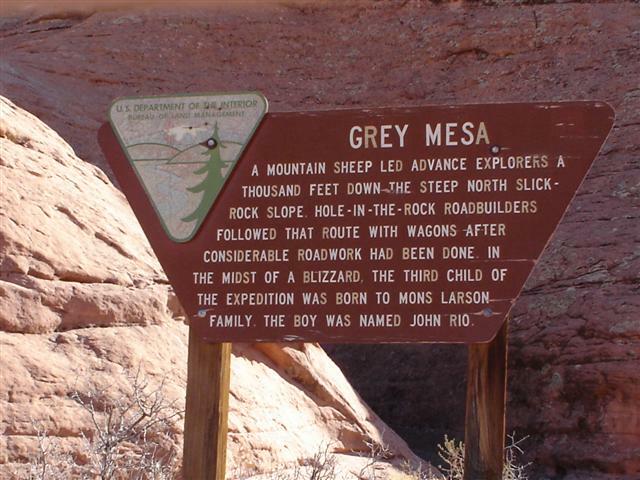 As we intersected the “Old Immigrant Trail” (which is the proper name for the Mormon pioneer route we now call the Hole in the Rock Trail) we were greeted by a giant sign alongside the trail. 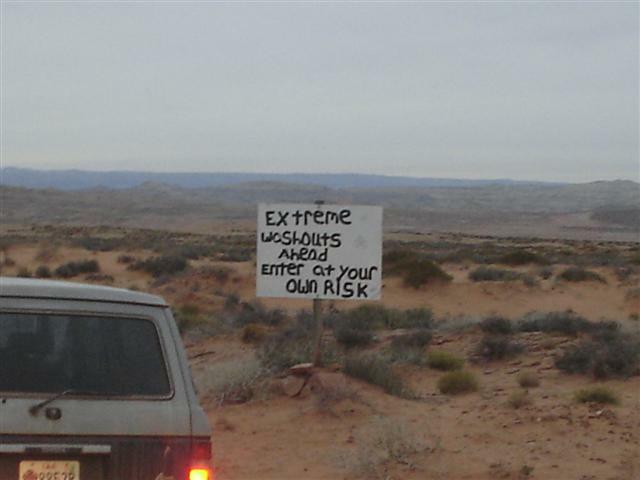 The sign read “Extreme washouts ahead, Enter at your own risk”, and looked as if it had been placed within the last couple months. I couldn’t help but hope it was a grossly exaggerated warning. The sun was setting quickly; thankfully we were approaching our first planned campsite. 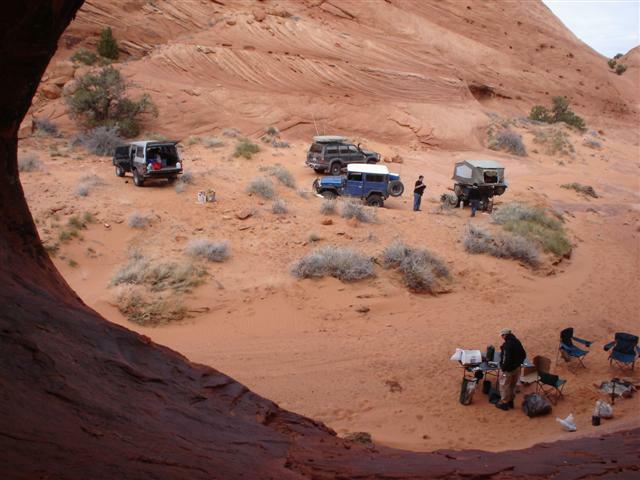 The campsite was located in a small unnamed canyon at the head of Lake Canyon. Its entrance was once guarded by Anasazi Indians, hundreds of years ago. Their stacked rock structure still partially stands overlooking the entrance to the canyon, surely a strategic fort in its time. The road to the campsite treks up the canyon just under a mile to a handful of campsite options between the streambed and the tall canyon walls. 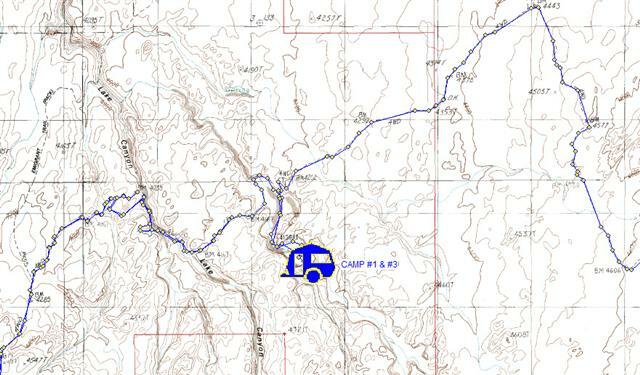 We had planned to avoid these campsites if there was any inclination of heavy rain as flash flooding is a very likely danger in this region of Utah. One can spot the depth of the flood level water line by the debris is washes up the sides of the stream bed as well as the limbs & leafs it denudes from the trees and shrubs along its path. With 30 degree weather outside the tent, we slowly crept out of our beds waiting for the suns warmth to invite us from our tents. Thankfully our resident pyromaniac Richard (a retired firefighter) had an inviting fire roaring by the time the rest of us were out of bed. A piping fire in the morning makes all the difference! 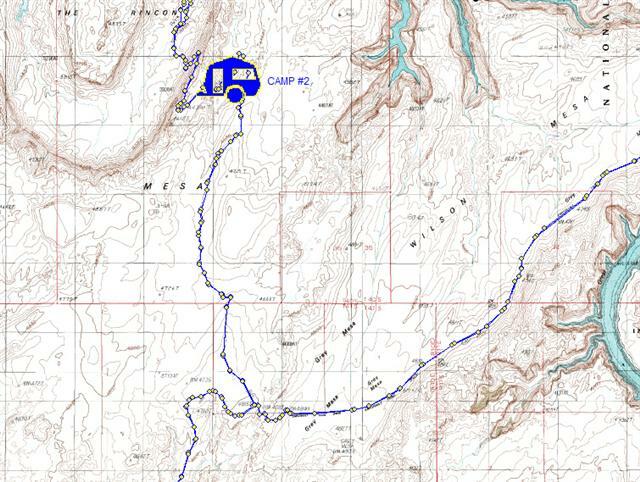 With camp broken down and our rigs loaded back up, we started on our way towards the mesa. We had been informed that at some point near the climb up to Grey Mesa, the trail had been severely washed out in storms several months ago. In our haste to move quickly, we didn’t even notice where the trail had once been; rather we followed the newly created portion which takes a half mile detour up a sand hill and over some slick rock where it rejoins the old trail. 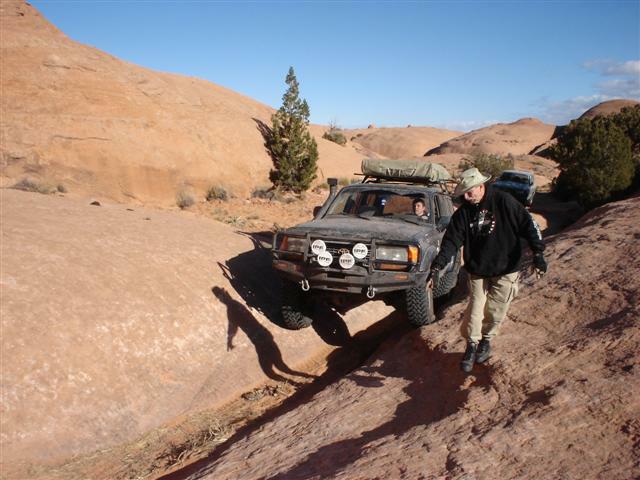 The trail continues across vast spans of slickrock and sand, which keeps speeds to a grueling 5 mile per hour average. The final ascent up to Grey Mesa follows a narrow shelf along a broken hillside, where once again the recent storms had taken their toll leaving the trail full of holes and ledges. 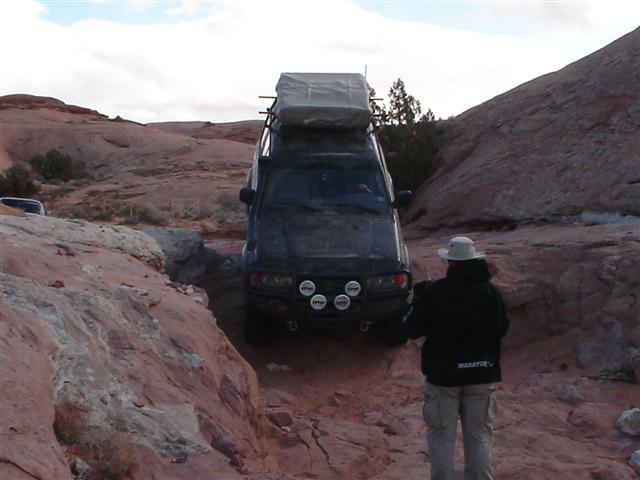 I was towing my trail trailer (weighing in around 800 lbs) behind my short wheelbase FJ40, the combination made for an interesting ascent and 3-wheel action. Once up on top of Grey Mesa, we were able to make some decent speeds and open it up across the mesa. 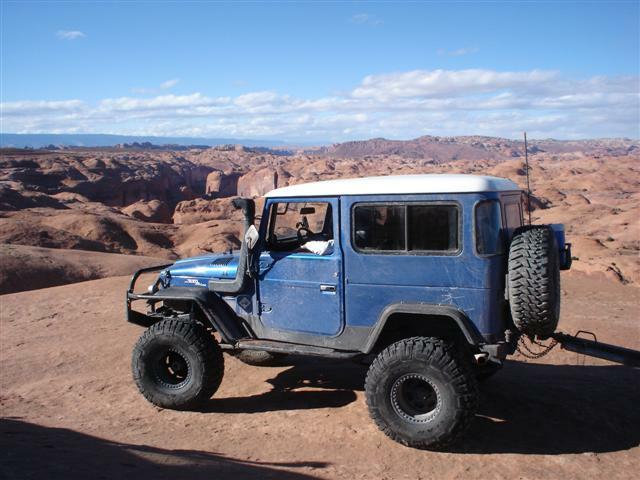 Driving along the mesa affords countless views of the San Juan River as it enters Lake Powell and a picturesque view of Navajo Mountain to the south. The trail continues along Grey Mesa and transitions into Wilson Mesa. Our voyage continued southwest towards our planned stop at the junction of the “Hole in the Rock Trail” with the Rincon Trail trailhead. Once at the junction we decided our next effort should be finding a campsite for the night. Thomas immediately took the lead on the trail towards Cottonwood Canyon, we decided we would try finding a camp spot there first, Rincon second. We found the trail towards the lake very exposed and having very little potential for offering a cozy campsite for the night. After arriving at the “Chute” (a narrow v-wedge shaped canyon that descends into Cottonwood Canyon and the site of the original pioneer crossing) we made the decision. With plenty of daylight to spare we turned back towards the Rincon trailhead. 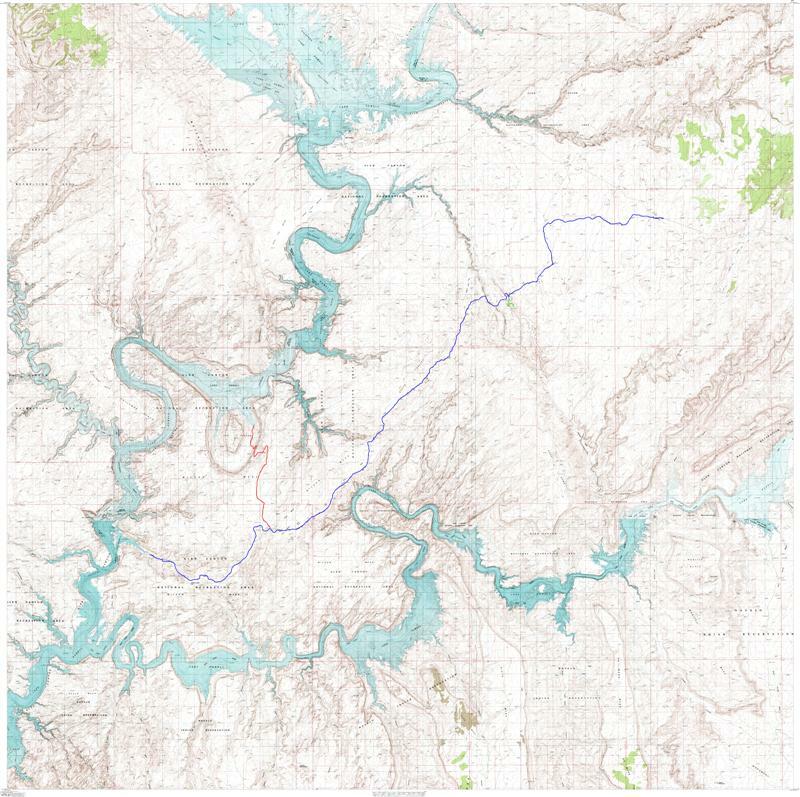 Our GPS track source didn’t have the Rincon Trail so we were on our own using just a few points imported from a USGS topographic map. 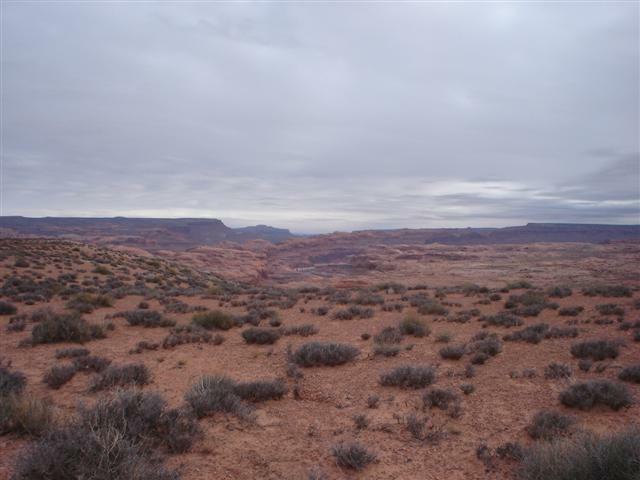 The trail’s seldom use yields it unnoticeable at times, to the point you couldn’t tell where the trail continued over the vast landscape of sandstone that lay ahead. 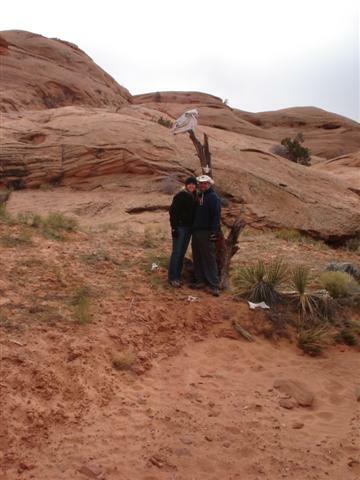 As we continued on along the trail, we soon came to a small canyon with a soft sandy bottom and steep sandstone walls towering above. 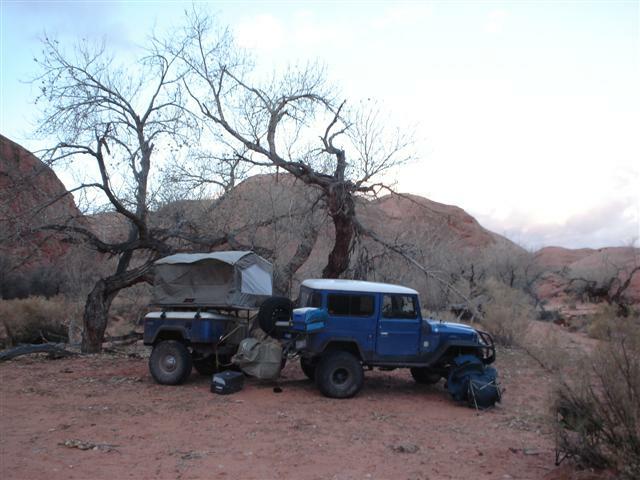 A perfect campsite! 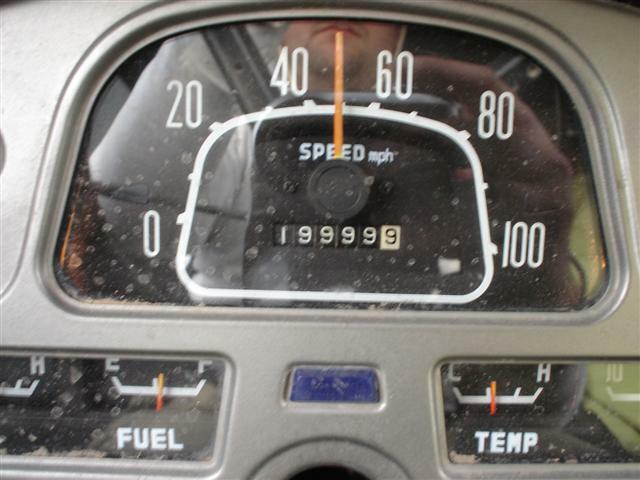 I decided to check out a couple of nagging issues on my Land Cruiser, one being a small bit of free play in my steering. As it turns out the play was within the box, so I tightened it up a bit and called it good. It was Richards night to cook, and his dutch oven stew was nothing short of stellar. The stars were out in full force across the night sky, tempting us to sleep on a tarp in the soft sand. With cold air settling in the canyon the tent seemed more inviting. We awoke to another gorgeous morning, a bit on the cold side but splendid nonetheless. 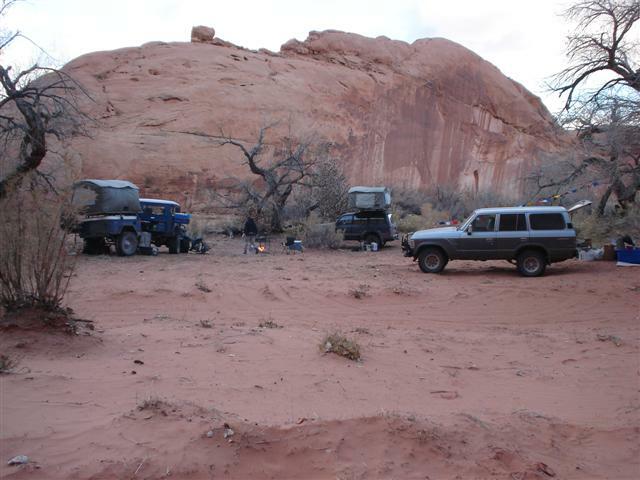 We had literally camped just feet from the trail, so it didn’t take long to hitch the trailer and get moving. 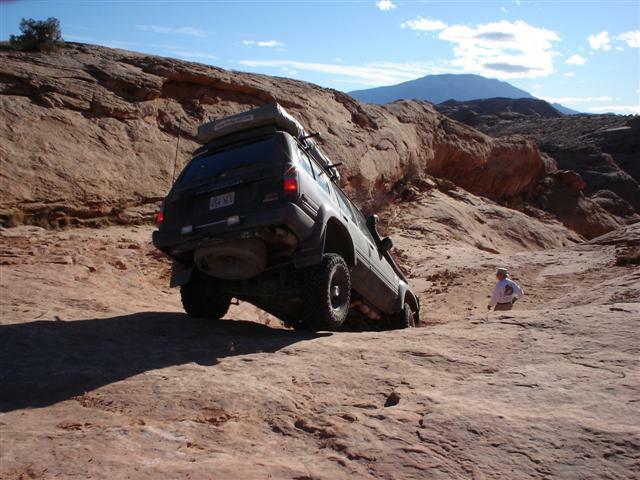 The Rincon trail takes a steep drop off the mesa towards the Lake Powell. 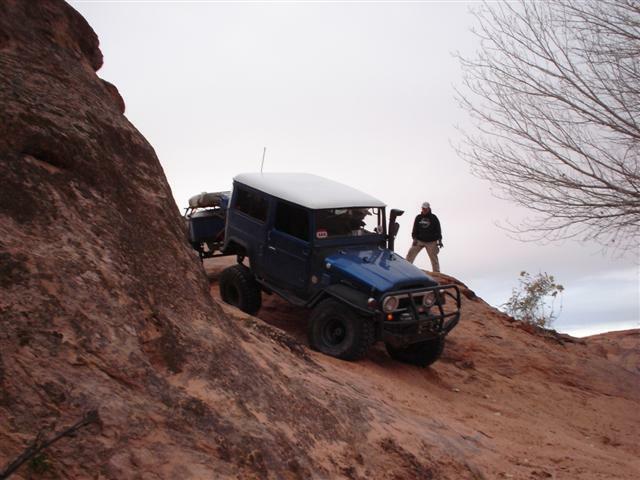 The trail is strewn with boulders throughout its drop, enough to keep you on guard as you are dangerously close to a big fall. 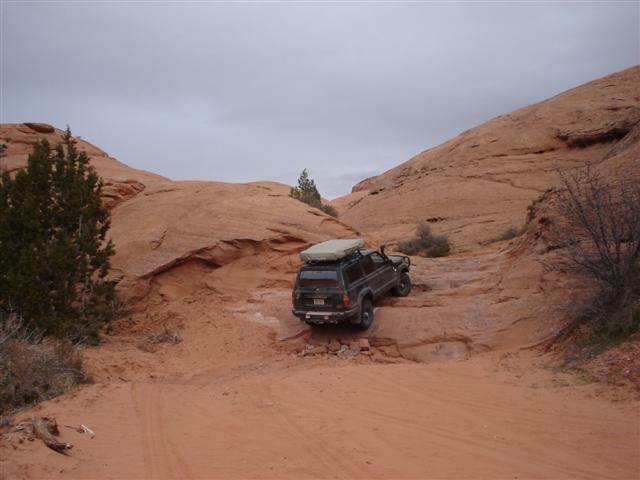 With little room for turning around and zero knowledge of the trail’s current condition, Richard thought it best to walk a portion of the trail to make sure it was passable. He walked ¼ mile of the nastiest section and waved the rest of us down the trail. It was slow going as we dropped along the narrow cut, but before long we had arrived at a short switchback, signaling the end of the drop. 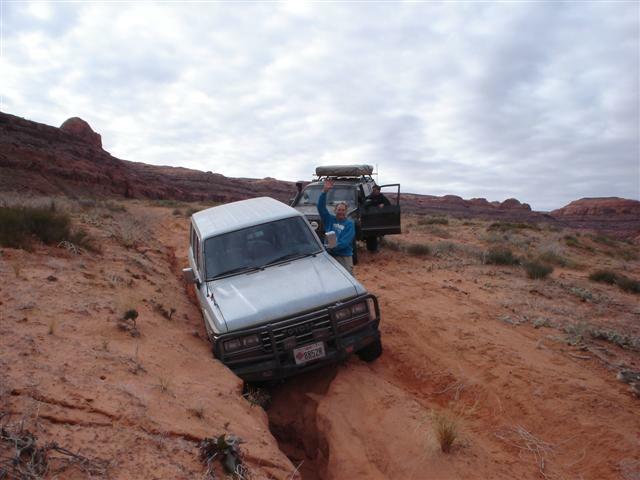 The trail has several deep ruts cut from recent rains, Richard tried to cross one but soon ended with his rig stuck with his front bumper jammed up against the side of the rut and high centered. Tom generously offered to give Richard a quick tug from behind, quickly bringing him back onto the trail. From the bottom of the cut to the lake was nothing more than a high speed jaunt through the sand washes and rocky hillsides that had been underwater as recently as 5 years ago. 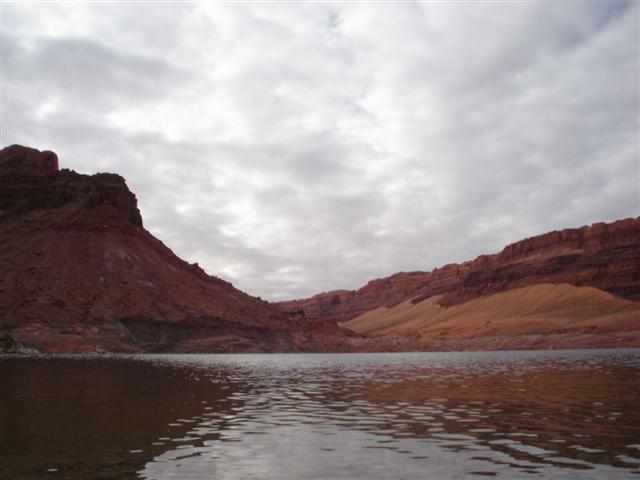 Lake Powell is suffering from a historic long term drought that has brought its surface level down nearly 100 feet, exposing features rarely seen in the past. We spent an enjoyable lunch on the shore of the lake, throwing rocks, snapping pictures, and taking in the scenery. The weather was starting to turn on us; cold weather was blowing in so we decided to get a move on. An hour later we were back to our camp and loading up the gear. By now the cold wind was blowing steadily, and Thomas picked up an incoming snow shower via the weather radio. 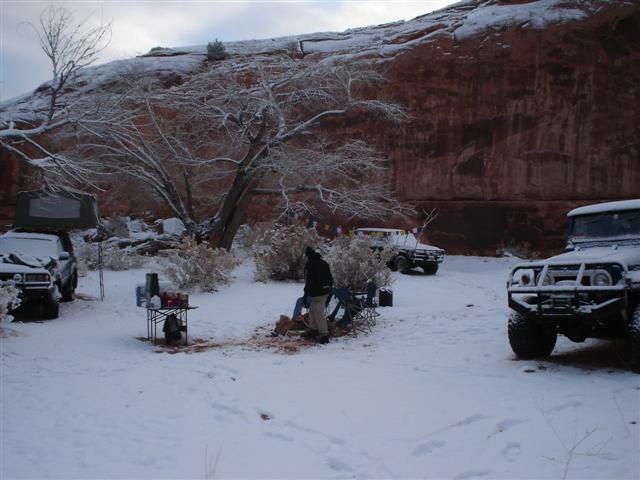 With an expected 2-3” of snowfall and lows in the mid 20’s, we didn’t want to spend another night on the mesa and have to face the ice and snow on our decent from Grey Mesa. The ledges and climbs that had challenged us on our way up, could be very dangerous with a layer of snow on them. So with camp packed up, we began our voyage back out towards the highway. Time on the trail seemed to pass a bit quicker on the way out. Maybe it is because we were in a hurry to beat the snow, or maybe it was due to the fact we had already taken in a lot of the sights, but most likely it was the fact we didn’t take so many wrong turns. We returned to our first campsite right around 5 pm, just as the snow started to drop from the sky. We quickly set up camp and tossed Toms “hobo” dinners in the fire as our hungers had grown over the long stretch of trail. It continued to snow late into the night, but it didn’t stop us from enjoying the company around the campfire. We passed time reading from the diaries of the Mormon pioneers that had crossed this exact terrain 127 years before us. A voyage that would take us just a couple days, took them over 6 months. We shook the snow off our tents and settled in for the night. Waking up to snow always makes things feel a bit colder than they actually are, thankfully Richard once again brought the fire back to life by the time the rest of the party began to move. We packed up camp, the last time we would do so for a hundred plus miles so it took a bit longer than our normal “toss it in the back” procedure. 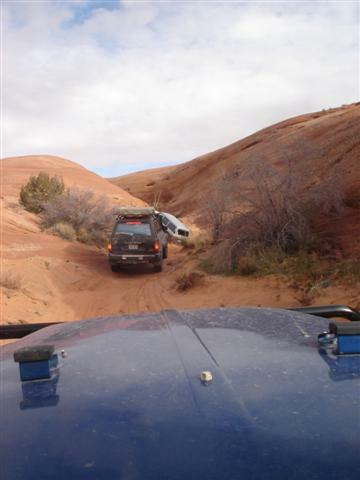 As camp was loaded and cleaned up, we motored on out the trail. We made even quicker time than our trip in the first night, aided by sunlight and our familiarity with the terrain. We decided to take a slightly different route out of the trail, allowing us to see something new while in the area. This route left us next to the airport adjoining the highway. There we spent the next hour or so airing up the tires, making lunch and planning our next stop. Airing up the tires turned out to be more work than we had expected. With ambient air temperatures in the 20’s, the liquid CO2 in the 10 lb tank had frozen into a solid chunk, allowing very little gas out of the bottle. 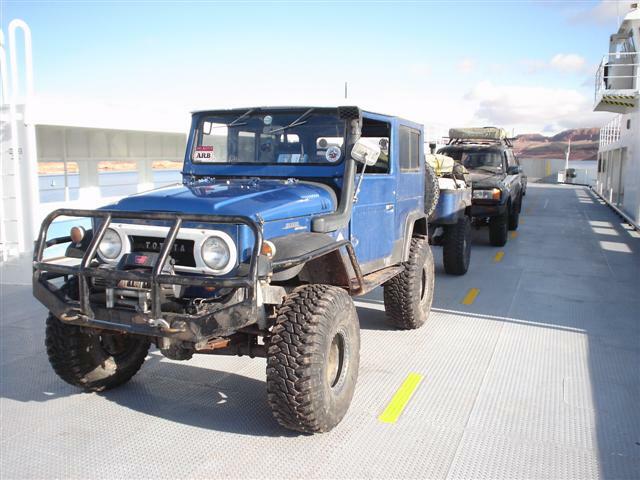 Up came the hood on my FJ40 and we used my ARB air compressor to pump up all 12 tires, using the CO2 sporadically to help speed up the process. 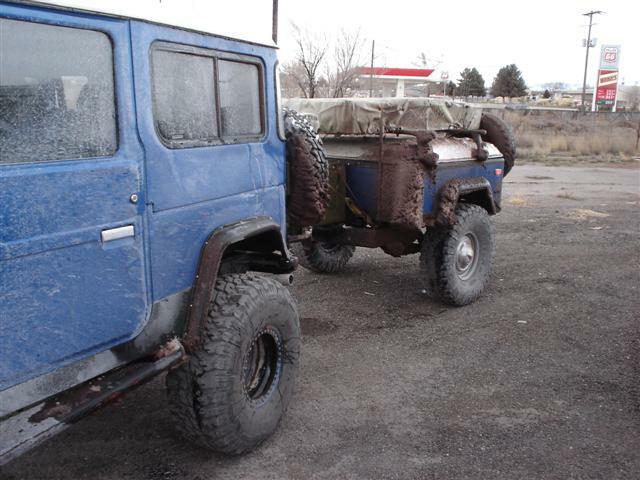 When the CO2 wasn’t being used, we placed it on the radiator of Richards FJ62 in an attempt to warm up the tank. While passing the time we were even able to convince Thomas to stick his tongue to the side of the frozen CO2 bottle, the things kids will do on a $5 bet. The ferry would leave soon so if we wanted to catch a ride we had to get rolling. As we arrived at the ferry we could see the captain and the deckhands manning shovels and water pumps on the loading ramp. In the few days we had been gone, the lake’s water level had dropped enough that the ferry’s ramp had to be moved out to the water. By pumping all of the water out of the ramp, they can essentially float & pull the ramp to its desired location where they then fill it full of water to sink it to the stable lakebed. Before we knew it, we all had shovels in our hands and were helping move dirt to build up the bank of the ramp allowing our vehicles to climb up to the boat. The boat’s passage is by no means free, they charge by the foot, anything less than 20ft is $20 per passage, and everything over gets charged a reasonable amount more. I measured in at 26 feet, while the others all made it under the limit with room to spare. The trip across the lake was equally as scenic as the ride days earlier, albeit much colder. We bundled up against the cold wind blowing off the glassy lake and enjoyed walking about the deck. Once across the lake we bid the boat farewell and made way to the gas station for some fuel and a much needed fountain soda. With an extra day to explore, we really had zero plans from this point; we decide to head north and plan later. We made another stop in Hanksville, it was just as sleepy as the days before but we didn’t want to pass up an opportunity to top of the tanks. 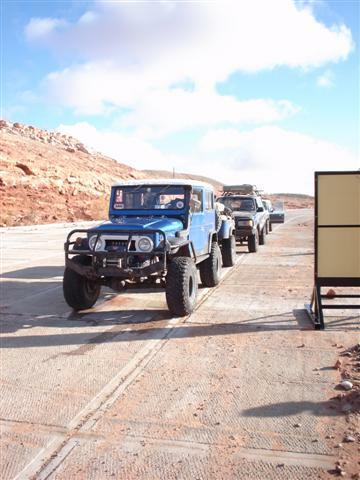 From Hanksville we continued on State Road 24 to the Goblin Valley and Temple Mountain turnoff. With a hint of daylight remaining we drove the loop through Goblin Valley, there was not a soul in site, which made the “ghoulish” figures even more eerie. Our next stop would be our resting spot for the night, so we decided to make way to a campsite I have enjoyed in the past just off the roadside in Temple Wash. We set camp in the shadows of Temple Mountain, a uranium mining hotspot centuries ago. 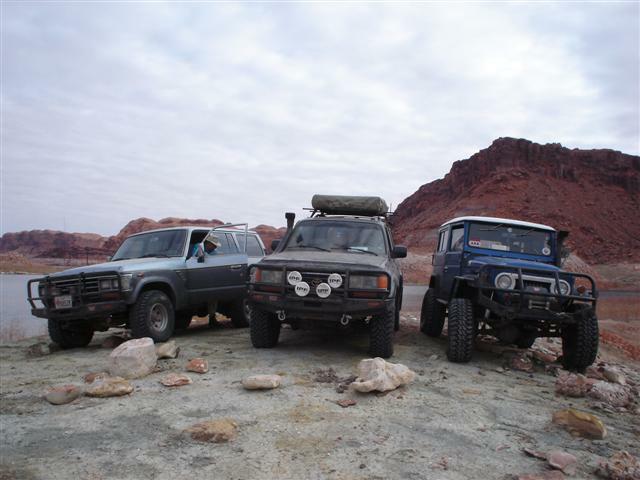 The majority of the roads in the area are remnants of the boom that put the area on the map; its desolation provided us with an ideal campsite for the night. We enjoyed a steak dinner as we sat around the campfire, getting closer and closer to the fire as the temperatures dropped into the evening. We awoke to another couple inches of snowfall, thankfully Richard had the fire roaring by the time Candace and I rustled from our slumber. A quick campfire breakfast and we loaded up the rigs. 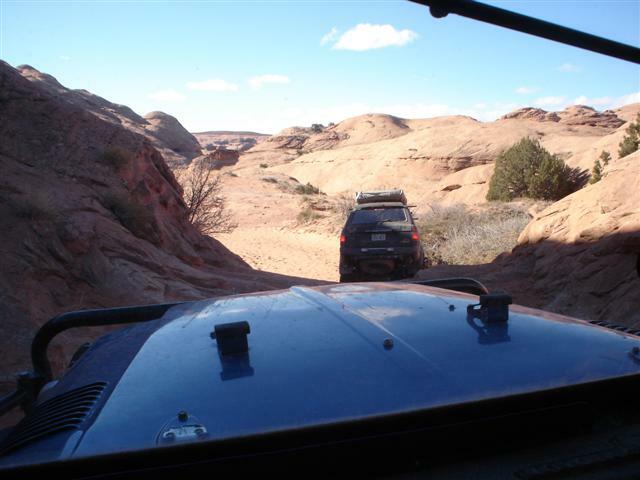 We decided to head north via the San Rafael Swell, rather the hitting the pavement so soon. 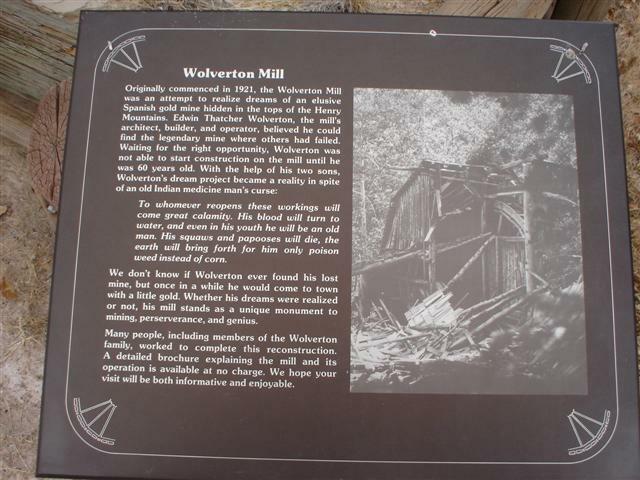 Our travels took us along the Temple Mountain Road, across the Heart of Sinbad Road where we then crossed Interstate 70 and continued north on the Cottonwood Wash Road, over the San Rafael River on the Swinging Bridge and finally the Buckhorn Wash Road into Wellington. The last stop of our adventure we be a small gas station, a short distance along the blacktop where we aired up the tires and prepped the rigs for the remainder of the trip home along the highway. All in all it was a most excellent trip. There is something to be said in this seemingly “crowded” world to be able to get out in the “middle of no where” and not see another soul for days. We logged over 700 miles from doorstep to doorstep, a couple hundred of them being in the dirt. Another adventurous weekend on the books! 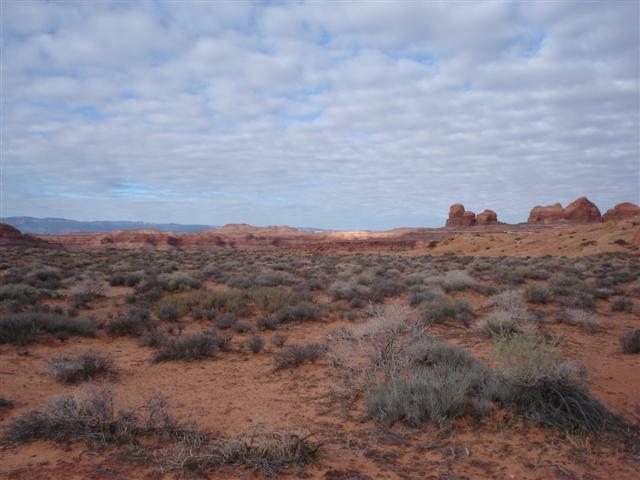 From 1879-1880, roughly 250 pioneer settlers from the southwest corner of Utah were called by their religious leaders to settle the southeast corner of Utah. Scouting parties were sent ahead of time in an attempt to find the shortest route possible for the group. 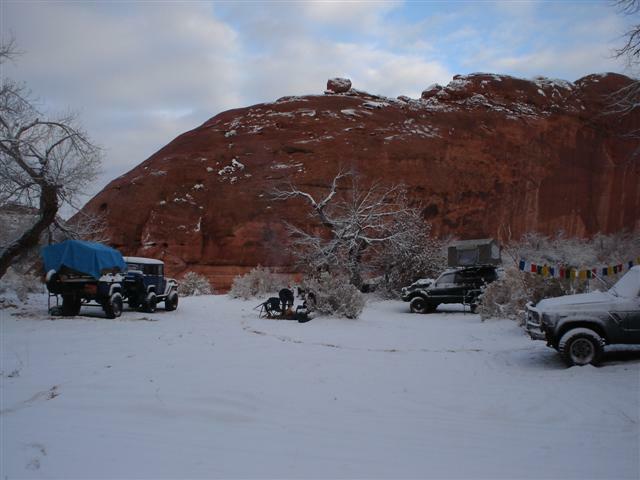 Rather than travel northeast to Green River and then south through Moab and beyond, the group took a treacherous route southeast. 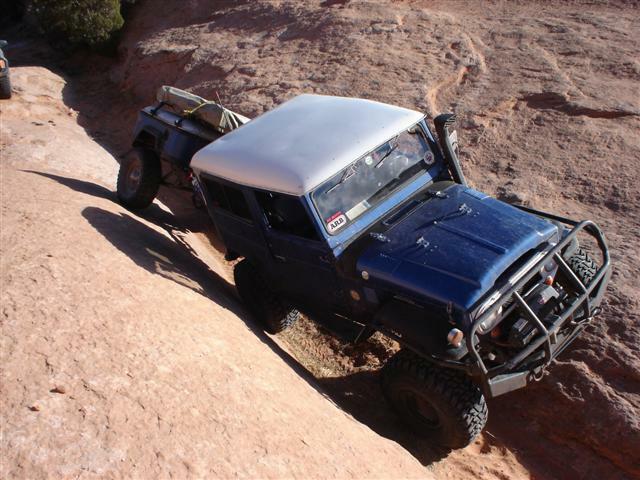 This route took them through some of the roughest terrain in the region including the deep Colorado River gorge (now Lake Powell). 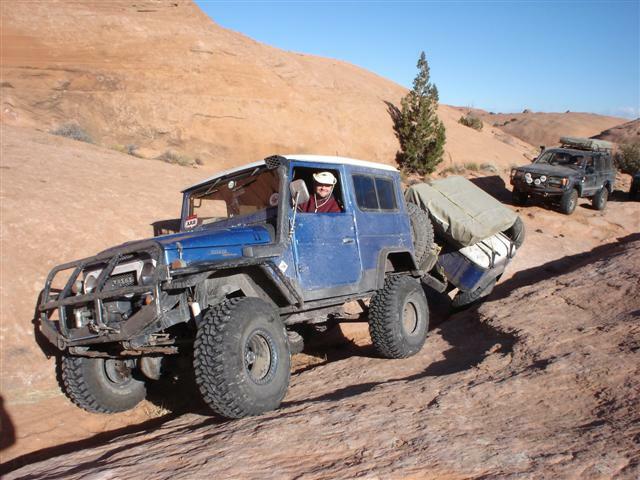 Their journey ended in Bluff, Utah after six long months on the trail. Thinking of visiting the area? 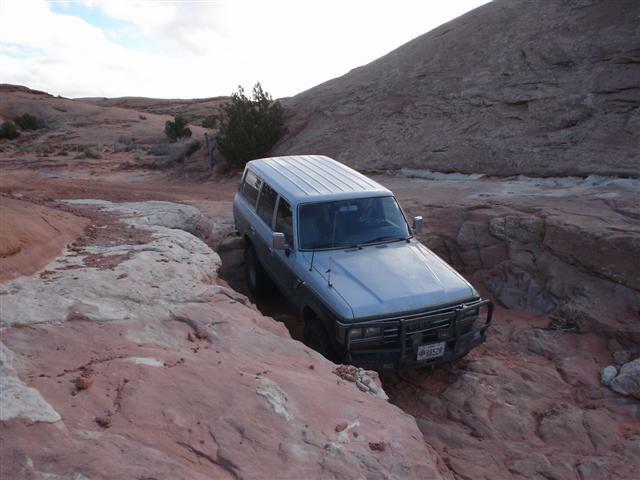 The Hole in the Rock trail is in vastly remote portion of Utah, plan accordingly. The area is surrounded by various National Parks, Forests, Monuments and countess other attractions, so allow yourself plenty of time to enjoy the area. 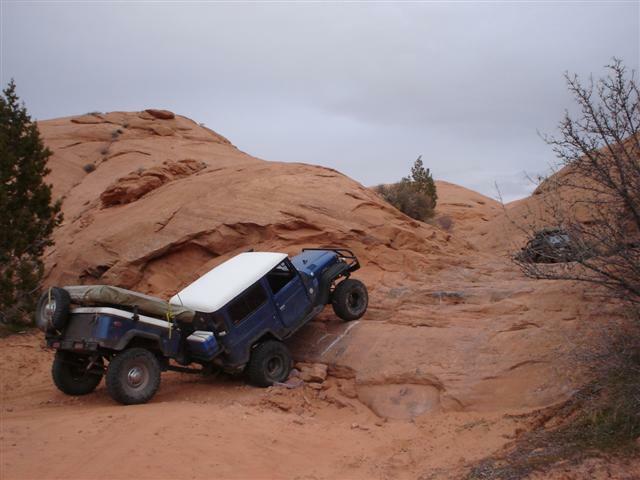 The trail as described is approximately 75 miles roundtrip and the distance to the nearest fuel stop (Bullfrog, Utah) is nearly 10 miles each way. Last but not least, check with the National Park Service for the latest ferry schedule and trail condition.